The Trigonometry examination covers material usually taught in a one-semester college course in trigonometry with primary emphasis on analytical trigonometry. More than half the exam is made up of routine problems requiring basic trig skills; the remainder involves solving nonroutine problems in which students demonstrate an understanding of the concepts. A calculator is not permitted on the first part of the exam, but an online non-graphing calculator is available during the second part of the test. 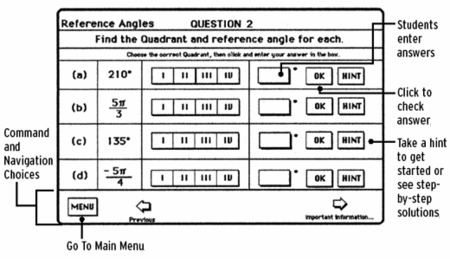 This computer software contains all the topics necessary for success on the CLEP-Trigonometry exam. (15% of the exam) Evaluation of trig functions of angles with terminal sides in the various quadrants or on the axes, including positive and negative angles greater than 360 degrees. (20% of the exam) Miscellaneous topics such as Inverse functions (arcsin, arccos, arctan) and Polar coordinates. This trigonometry computer software program contains 26 learning sections (30-60 minutes each) and two practice tests with explanations and solutions. Graphing calculator instruction is also included. 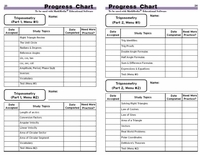 Track your progress on the Progress Chart (included).